Thousands of customers travel through our stations every day. So when a customer from another airline experienced a medical issue in Chicago (ORD), teamwork, collaboration and know-how saved the day. There was just one small problem – the customer didn’t speak English and professional medical assistance took almost 15 minutes to arrive. When medics arrived, Mahwish accompanied the customer to the hospital to offer assistance and get him the correct treatment for his condition. He was released the following day and returned to Qatar later that day. 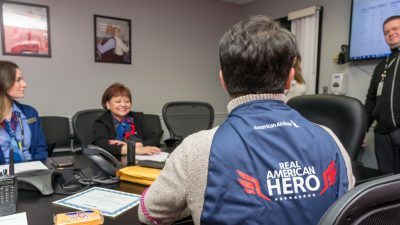 On Monday, April 16, agents gathered around to present Alex, Joanne, Mahwish and Rodney with a Real American Hero award, which comes with a $1,000 cash prize and a very special hero cape. Thanks to everyone’s teamwork and collaboration, a customer received some first-class coordination and teamwork during an unexpected medical emergency. Here’s to Alex, Joanne, Mahwish and Rodney – you’re all heroes. Special thanks to ORD Shift Manager Jon Farabee for submitting this Real American Hero nomination for the team.